This entry was posted on Friday, January 22nd, 2010 at 7:28 am by Manolo the Shoeblogger and is filed under Boots, Ugg. You can follow any responses to this entry through the RSS 2.0 feed. Both comments and pings are currently closed. Too bad, I just love wearing uggy type shoes. How the hell am I supposed to run, dance and skip around with a vive de joy in Manolo’s. I always feel handicapped in those kinds of shoes. My favorite is summer when I’m barefoot. If I must wear a shoe then it’s a flip flop which i suppose is the equivalent of a ugg. Oh dear I guess that makes me super square. I own wedge-heel ankle boots as well and they are perfect for winter, comfortable but also make your silhouette look leaner – and still have that toasty warm look. Definitely prefer them to UGGs but I am 29 after all! Gosh! 29! Dear Alice! Practically the grave! ;-). You have a few good years yet. Thank you Manolo for explaining with such clarity why moms and teen daughters can share some clothing items, but not all of them. Manolo you are dead on with this post! I just found your blog via problogger and I LOVE it! A question: I’m 32 and my daughter is 13. I wear my uggs under straight leg jeans, not over them anymore because I do feel like I’m trying to look “young!” What do you think? Do they come in a size 11 or 12? I would submit that the whale-tail thong (if by that you mean, a thong that is visible to anyone but the wearer before she puts on her pants) is nobody’s fashion, not even the young person’s. Let’s put the “under” back in underwear. Oh, dear. If only my 70 year-old mother would heed your sage advice, querido Manolo. She has just bought herself the Ugg clones, and also told me that she wanted to get some leggings to wear under a tunic-y t-shirt dress. Yes, she has greater gams than I could ever aspire to, but there are some looks that one should leave to one’s granddaughters, and these are they. 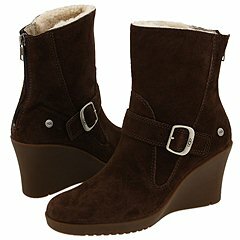 I am 35, and I have nothing but hugs for Uggs! They are the flip-flops of winter as they require no socks.